There are hundreds of barcode-reader apps (e.g., RedLaser and QuickMark for iOS and Android devices, and the Kaywa reader for dumber smartphones), and code-reading can be included in custom apps, e.g., a museum tour. 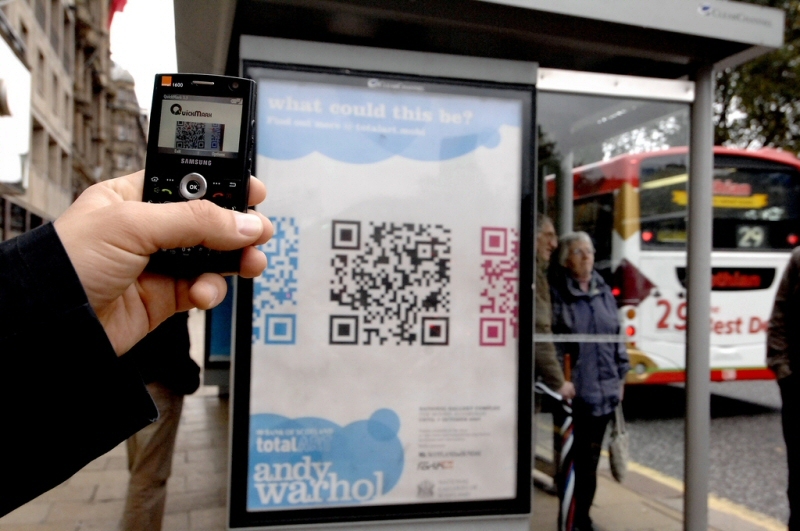 QR codes are currently the best way to transmit information from the real world into an app. The codes were originally designed in 1994 for tracking car parts at Toyota, but they have recently exploded in popularity, and are becoming more familiar to the public. ComScore reported that 14 million American mobile users scanned a QR code in June 2011 (6% percent of all mobile device users). Linda Kelly at the Australian Museum recently surveyed 100 visitors, and 15% said they have scanned a QR code. The QR codes are used by Love Lace visitors, but are not a hit. In the first month, the exhibit reported 572 iOS and 165 Android app downloads. People used the app an average of 5 times on iOS and 3 on Android (including when they are not in the exhibition). The QR feature was only used 844 times in the first month, with a 5% failure rate, and 2% of scanned code unrelated to the exhibiton. Visitors scanned fewer than 2 objects per app download, suggesting that visitor did not think it was worthwhile. Many objects were not scanned at all. App developer Carlos Arroyo says they intend to add more interactivity. What do QR codes look like? The QR codes (short for “Quick Response code”) are a two-dimensional version of bar codes, consisting of a box of black & white squares. The codes can vary in complexity. Encoding up to 15 alphanumeric characters does not require many pixels (top left), while encoding up to 395 characters requires a more densely packed matrix (top right). Also, the codes can be customized (bottom row). The codes employ error correction, so your designers can replace up to 30% of the space, and the code is still readable. 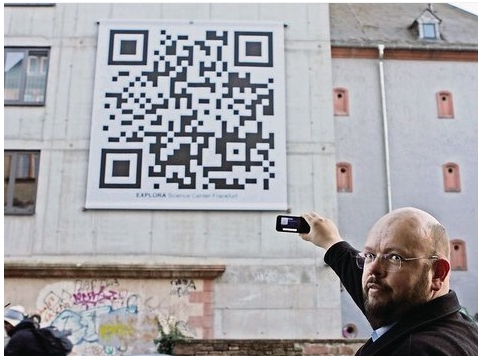 However, if you get too artsy, your audience might not realize it’s a QR code. QR codes are useful for promoting your work because they provide an easy way for the public to learn more about your project, and they are rapidly being adopted by many industries. Book publishers are using QR codes to link to additional content. Academics like Katy Meyers have added QR codes to her poster at a professional conference, where she got 30 more hits to her web site than usual. Washington, D.C. middle school teacher librarian Gwyneth Jones has created cool library scavenger hunts with QR codes. If your organization is thinking about creating mobile content to complement a new exhibition, whether in an app or a mobile-friendly web site, think about what kinds of additional content, information, audio and video, interactivity or social media you can link to, so as to enrich your visitors’ experiences. 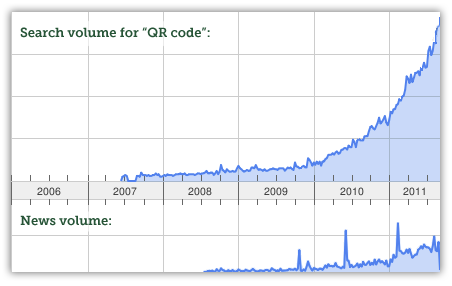 14 comments on What are QR Codes? And how are they useful for outreach? 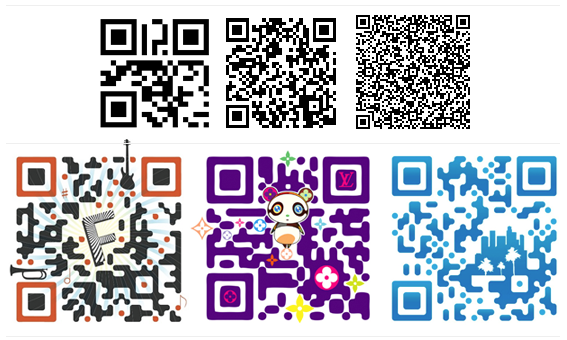 If you like to design QR codes, like the Louis Vuitton one, try our QR code design software. It's for free! I recommend you use to generate QR codes http://uQR.me. With this QR code generator you can generate a code and change the destination whenever you want without having to change the QR itself. Thank you for this blog post. We'll be recommending it to our "Exhibitions Boot Camp" workshop participants as a good source for delineating museum use with good examples and tracking the prevalence of QR codes. These are some great example of uses of qr codes. Thanks for sharing this! My favorite one is the park sign! What a great post and a noble motive! I'm making blog calls to all @scio12 attendees to say "Hi" and give a shoutout of your blog on twitter (I'm @sciencegoddess). I look forward to meeting you in person in January! You forget http://uQR.me here!! I use uqr.me code since 2010.. free stats, qr code colors customization, paypal payment option.. Why you don't list them here? This service is easy to use and the design is clean, and the best part: there are no ads! !